The Moon Palace Jamaica, formerly the Sunset Jamaica Grande, is the first Palace Resort in Jamaica and is located in the heart of Ocho Rios. Here the legendary Palace Resorts brand of awe-inclusive luxury makes beautiful harmony with the laid-back warmth of Jamaica. Learn more about this resort. Moon Palace Jamaica is an all-inclusive resort. Room rates include meals and beverages at onsite restaurants and bars. Other items and amenities, including taxes and gratuities, and access to recreational activities and entertainment may also be included. Additional charges may apply for meals at some restaurants, special dinners and dishes, certain beverages, and other amenities. In addition to a full-service spa, Moon Palace Jamaica – All Inclusive features an outdoor pool and a spa tub. Dining is available at one of the resort’s 4 restaurants. The property also offers a snack bar/deli. 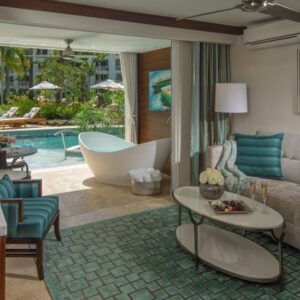 Guests can unwind with a drink at one of the resort’s bars, which include 7 bars/lounges, a beach bar, and a swim-up bar. High-speed wireless Internet access is complimentary. This all-inclusive resort also offers a fitness center, a sauna, and a steam room. Onsite valet parking is complimentary. With 705 rooms, the Moon Palace Jamaica offers a choice of partial and deluxe ocean views, family deluxe accommodations, and a concierge level. This all inclusive resort is smoke-free. Complimentary CHI bath products accompany the in-room use of CHI hair dryers and flat irons. Enjoy 24 hour room service, complimentary internet, a $1500 resort credit and other great amenities like in-room full bottle liquor dispensers and stocked mini bar. Luxuriating in paradise sure does build up an appetite — and at Moon Palace Jamaica there are no shortage of ways to satisfy it. There are 4 inclusive restaurants and 6 bars that serve free flowing alcoholic and non-alcoholic drinks. Guests will also enjoy 24-hour room service. This beachfront all-inclusive resort is located in Ocho Rios, close to Ocho Rios Craft Park, Turtle Beach, and Mahogany Beach. Also nearby are Turtle River Park and Taj Mahal Mall. Onsite meals and beverages are included in the room rate at Moon Palace Jamaica – All Inclusive. The resort also features 4 restaurants and a full-service spa. LCD televisions come with satellite channels. Guestrooms also feature complimentary wireless Internet access, iPod docking stations, and air conditioning. With a stay at Moon Palace Jamaica – All Inclusive in Ocho Rios, you’ll be on the beach, steps from Turtle Beach and a 4-minute drive from Mahogany Beach. This 5-star property is 3 mi (4.8 km) from Dolphin Cove and 3.3 mi (5.2 km) from Dunn’s River Falls. Relax at the full-service spa, where you can enjoy massages, body treatments, and facials. You’re sure to appreciate the recreational amenities, which include 4 outdoor swimming pools, a nightclub, and a sauna. Additional features at this property include complimentary wireless Internet access, concierge services, and an arcade/game room. Enjoy international cuisine at Buccaneers Reef, one of the property’s 4 restaurants, or stay in and take advantage of the 24-hour room service. Snacks are also available at the 2 coffee shops/cafes. When you are in need of a refreshing drink, visit the beach bar or one of 4 bars/lounges, or 2 swim-up bars.